North Downtown is a city-designated neighborhood extending from McIntire Park south, down Park Street. The neighborhood includes the Charlottesville-Albemarle County Courthouse District. North Downtown is listed as an historic district on the National Register of Historic Places and the Virginia Landmarks Register. At the center of the North Downtown neighborhood is historic Court Square, the oldest portion of the City of Charlottesville. Settled around the Albemarle County Courthouse, some of the buildings date to the early 1800's. Court Square was the first commercial center. According to the 2000 census, there were just over 2,000 people living in North Downtown, but with building infill, new apartments and condominiums, that number may now be higher. The neighborhood has private homes and rental properties. There are six condominium buildings, seven apartment houses, and three private schools. As this neighborhood lies in the heart of Charlottesville, it also contains City Hall, the County Office Building, and all Courts: Federal, City and County Circuit Courts, City and County District Courts, and Juvenile Court. There is a large art gallery (McGuffey Arts Center, an historic building), the main library (an historic building), the Historical Society (an historic building) a USPS post office branch, the Downtown Transit Center, several churches including the only synagogue (an historic building), a Catholic Church (an historic building), the only Greek Orthodox Church and several entertainment venues including a restored historic theater. The central piece after our historic properties is the Downtown Mall. The neighborhood is pedestrian oriented, as residents walk to the above venues. 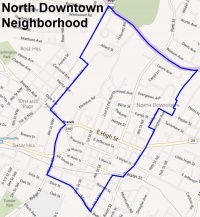 The North Downtown Neighborhood is represented by the North Downtown Residents Association. This page was last edited on 2 June 2012, at 11:35.